Jellybean poked his face out the hole. This was the first time he’d come out of his burrow. His little pink nose twitched as he sniffed the different springtime smells. He sprang onto the tender grass, which tickled the bottom of his paws. It was soft and poked into his nose when he bent down to sniff it, making him sneeze. Achoo! 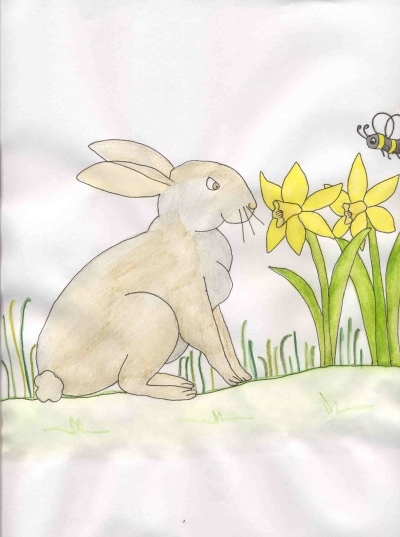 As he looked around, Jellybean saw a clump of bright yellow daffodils. They looked like golden trumpets swaying in the gentle breeze. He hopped closer and noticed something moving about. It began to buzz loudly, scaring the bunny. Jellybean jumped backwards, tripped, and landed on his back. The black and yellow bumblebee flew out of the daffodil, its wings vibrating up and down. It soon disappeared inside an orange-red tulip. Loosing sight of it, Jellybean hopped on. It didn’t take long before he heard other strange noises. His long, furry ears stood straight up in the air. His nose began to wriggle as he hopped towards the stream. The water was flowing over the rocks, making small waterfalls. Jellybean was curious. He stuck his paw into the cold water. Soon the fur on his paw was soggy. When he spotted his reflection, he reached out to touch it, but it disappeared with the ripples when his other paw hit the water. "Quack! Quack! Quack!" Jellybean looked upstream and saw a white duck with an orange beak. It was swimming towards him, followed by three ducklings. They were fluffy and yellow. They swam right up to him. He touched one. It was soft. When it quacked, it sounded much quieter than its mother had. Jellybean giggled when the duckling dipped its head under the water and pulled out a green leaf. Another duckling waddled out of the stream. It tried to eat Jellybean’s fur, biting him. "Ouch!" he shouted and hopped away. A tall, leafy tree stood in the middle of a meadow. Jellybean lay down in the shade and looked up, into the branches. There was a bird with a red belly sitting in a nest made of twigs. He could see a few speckled eggs cupped inside it. They were as beautiful color as the sky. The bird chirped and sang a song to her eggs. Jellybean tapped his foot and wiggled his whiskers. After his rest, the bunny hopped through the flowers. There were white daisies with bright yellow centers, purple violets and pink pansies. Jellybean was so busy looking at all the different colors that he hopped right into a black and white cow. Jellybean fell onto his back and looked up at the angry cow. "Moo! Moo! Moo!" Its big brown eyes gazed down at him and it had grass hanging out of its mouth. Jellybean was relieved when the cow walked away and began nibbling on some daisies. Jellybean was beginning to tire, so he turned and headed back to his burrow. He stopped when he heard something giggle. Peeking through some prickly purple thistle, Jellybean saw a little girl. She had long, blonde hair that hung all the way down her back. Her frilly, pink dress was covered with lace and she held a straw basket in her hands. His eyes grew wider and wider. In the basket were colored eggs. There were pale pink, yellow, purple, green, and blue ones. The girl was sitting among the flowers nibbling on a chocolate egg. She was giggling with delight. This made Jellybean feel happy inside. A yawn reminded the bunny that he was tired, so he headed for home. Just before he reached his burrow, raindrops fell from the sky. He had to wait under a large leaf until it stopped. Luckily it was only a spring shower. The air smelled clean and fresh and Jellybean was surprised to see a rainbow spread between the clouds. Before he went inside his burrow, Jellybean looked all around. He had enjoyed his first day out. He knew there was much more to see, but that could wait until tomorrow.